To mark the anniversary of Jackie Robinson birth on January 31, 1919 We are going to take a look at the opening card of the 1953 Set. We previously covered this card in 2013 and it now serves as the anchor posting for our Jackie Robinson HOF Index. That posting is largely a price guide for the card. Today I want to take a look at the back of the card. Cartoons first appear on the backs of cards in 1953. 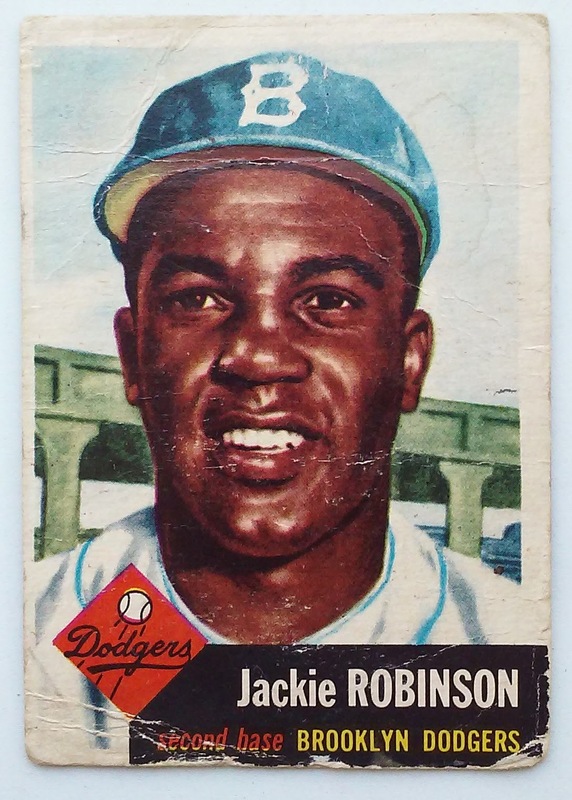 As the resident of the #1 slot in the set Jackie Robinson also has the honor of being the face of Topps first -toon. Ok this isn't in the same stratosphere of the Hall of Famers other accomplishments, but it is of interest to the card collector in me. 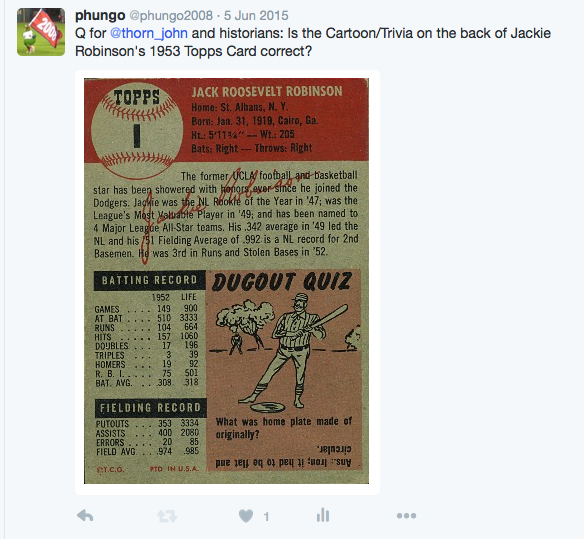 The first -toon is an interesting one, I doubt I would have even noticed it on a less noteworthy players card, but Jackie Robinson will make sure I look. When I read the card I questioned the veracity of the information in the text. It specified that the original Home Plate was made of iron. Fortunately in the 21st century via the magic of Twitter we can go right to baseball historians who have done much research around such topics. Here is the question I posed to the MLB official Historian John Thorn. Soon afterward John Thorn replied! And he filled in some details. Yes the Plate was originally Iron, and he added some bonus info. That is a lot of critical historical info in under 140 characters. It doesn't end there. One of Thorn's followers fleshed out some details on Home Plate. Those details were then further elaborated on by John Thorn. So there we have the reasons for why we call the base Home Plate and the chronology of from the 1845 disc shape to the present shape. We have recently been obsessed with #1 Cards. This posting will be a second entry for 1953T #1, which to me is the greatest of all the Topps #1 cards. 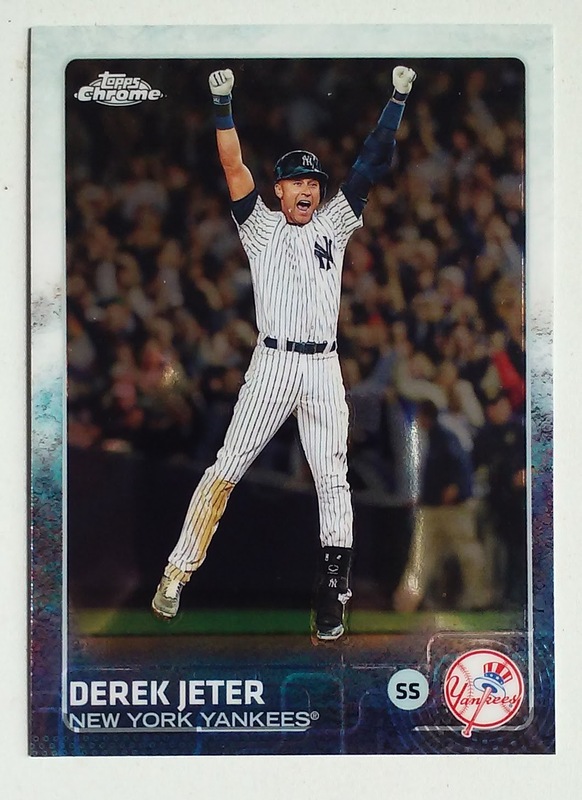 A few nights ago we ran a column on the Derek Jeter 2015 Topps #1 card and how it compares with the companies other opening cards. I classified all the #1s in relation to the Jeter card. The judging was very subjective, and this is one of the cards that I determined was better than 2015T Jeter. Lefty got the nod because he is one of my favorite players from when I was a kid and was the Ace for the Phillies first World Championship team in 1980. Your results may vary - if you don't like it, write your own blog. 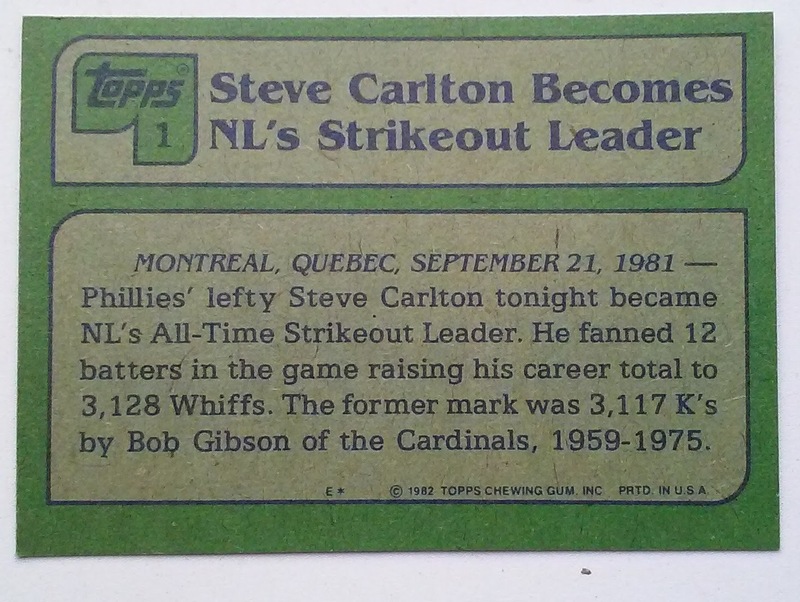 Steve Carlton broke Bob Gibson's NL Career Strikeout mark on Septemember 21st 1981 in a 1-0 loss to the Montreal Expos. The tying K took place in the 2nd inning against Montreal Third Baseman Larry Parrish. The following inning Carlton struck out Hall of Famer Andre Dawson with the Record Breaker. 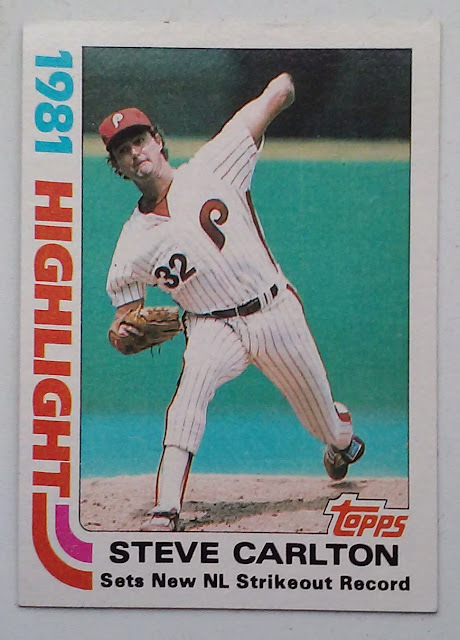 The OCD collector in me would like to point out that the above Photo of Steve Carlton shows Lefty in the Phillies Home Whites. This means that the picture was NOT taken at the game in which Carlton broke Gibson's records. The back of the card contains some info on the game without noting that the Phillies lost that day. The L was not on Carlton who pitched 10 shutout innings. The game was in the 17th inning when Dawson recorded a bases loaded single to give the Expos the victory. An incredible dozen different players were penciled in the Number nine spot for the Phillies that day including Rookie Ryne Sandberg who entered the game as a pinch runner. The text also mentions the previous record holder Bob Gibson who was honored by Topps with a Highlight Card in 1975 commemorating his 3000th strikeout. It makes me happy that Abe Vigoda lived long enough to make it into the Topps Allen & Ginter's collection. Of course it took them eight releases to get around to publishing the card of the cult icon. In addition to this base version of the card there are Relic and Autographed cards as well as A&Gs several parallels. The text on the back has Vigoda's standard Bio mentioning the Godfather and Barney Miller. Bonus points for noting the Fish spinoff, however a "Boo" for ignoring is late nite tv cult status. 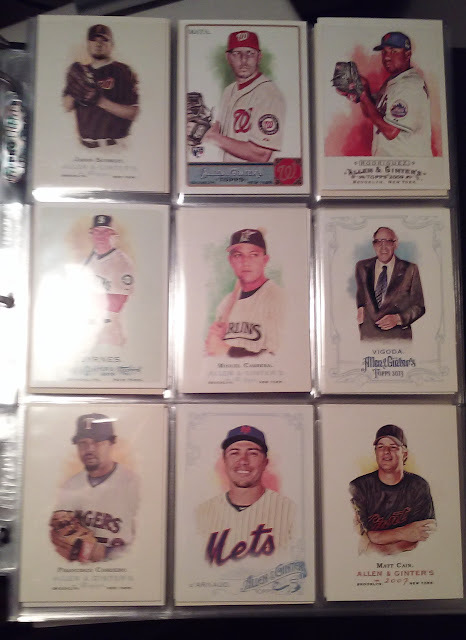 I have never built an A&G set, but I do pick up a few packs or perhaps a blaster each year. From these purchases and fervent dime box procurement I have built a near complete Frankenset. I am happy to report that Fish is presently holding down the #176 slot in the Phungo AnG Binder - right next to a 2006 Miguel Cabrera Card. 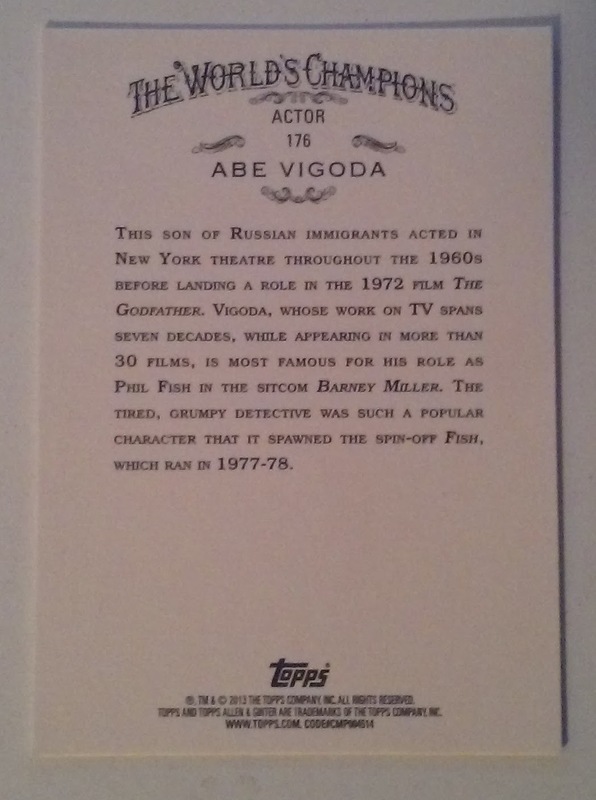 In additon to his TV and Film work Abe Vigoda was also a busy theater actor. 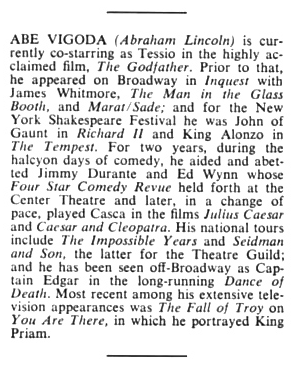 In 1972 he apprently played Abraham Lincoln in something called "Tough to Get Help"
Interesting to see Abe Vigoda's bio as he was just coming off of his Godfather performance. 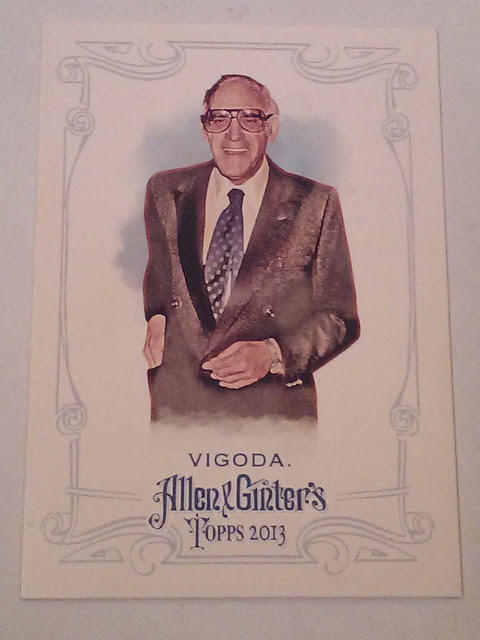 Cool to see him mentioned with Jimmy Durante as part of "the halcyon days of comedy"
Topps recently released their 2016 Series 1 checker....without card numbers. Doesn't sound like much of a checklist, but I do understand the attraction to withholding the info until the date of release. Bryce Harper who is this years cover boy and has already sat at #1 is a legit candidate as are Mike Trout, Matt Harvey and possibly a Kansas City Royal. When 2015 Topps was released last year there was some discussion on the choice of Derek Jeter for the #1 Slot on the checker. Those unhappy with Jeter at #1 were mainly concerned that a retired player took the top spot in the set. In my opinion this is boloney. I think those that didn't like the Captain at number one were Jeter/Yankees Haters. In my opinion this is a great card. It captures a moment that every baseball fan knows. It is a career moment rather than a big postseason play.The picture has action, excitement and emotion. The 2015 design is a good one - throughout the set it helps show of a photo without detracting from the shot. I am a little surprised that Derek Jeter has never* appeared as Card #1 in Topps, he has been the last card and been the subject of a noteworthy variation but never #1. We took a look at the history of Topps #1 and broke down the cards to figure out which cards we liked best. Charted below are the results - For each card I list the subject Jeter is competing with, and then two columns Jeter and Field. If I felt that this years card was better, The Jeter column gets noted, otherwise the Field Column is labelled the winner. There are nine grey blocks that I felt were debatable, A good argument could get me to switch my allegiance on any of those columns. For the life of me I have no idea what I was doing with the yellow blocks. 2015 marks the 64th edition of Topps. Of the 63 previous I felt as the the Derek Jeter #1 Card was better than 27 of them. The field took the remaining 36. HOWEVER, if you were to give Jeter all 6 of his borderline that would elevate this years card to 33 Wins versus 30 for the field. 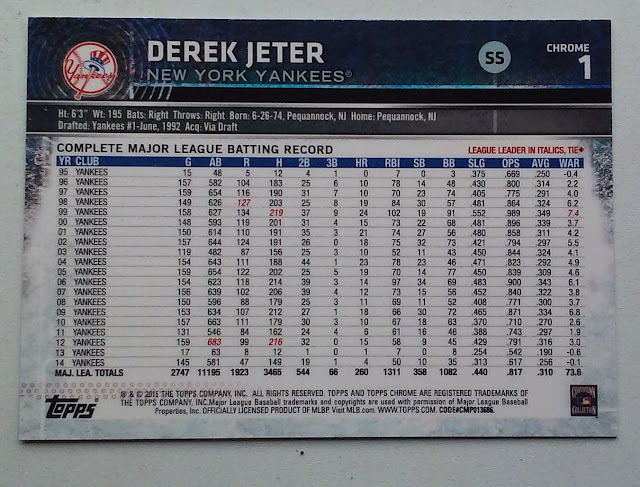 That puts 2015 Topps #1 Derek Jeter pretty close to the middle of the 63 #1 Cards all time. The Green Blocks are links to postings on the specified card. See "Topps #1 Project" below for additional info. We have an index of the Topps #1 cards here. Just another of the many features that we plan on starting for 2016, who knows how far we will get into the project. Also cards listed in green link to a posting discussing the specific #1 card. Some of these cards are from past columns. Hopefully the future will have additional posts.